area around the umbilicus (navel or belly button). where the umbilical cord was attached. If the bubble cannot be pushed back up into the abdomen it is called a non-reducible hernia. abdomen then it is called a reducible hernia. 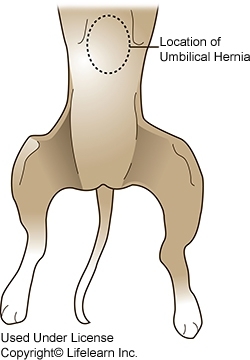 non-reducible hernia as the puppy matures. at least a partial genetic predisposition to the condition. pose no threat to the dog. ​of the condition prior to placement. 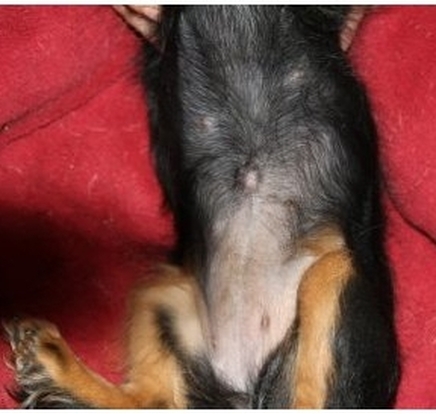 If the hernia has not closed by the time of spaying or neutering, surgical repair of the hernia is recommended. have formed around the hernia are dissected out or removed, and the defect is closed with sutures. it is so common in the breed and a very minor health issue easily correctable.